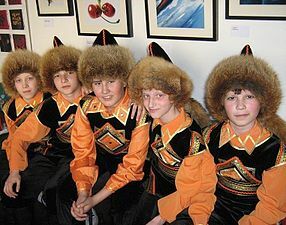 It is generally agreed that the first Turkic people lived in a region extending from eastern Central Asia to Siberia, with the majority of them living in today China. A ethnolinguistic study (Robbeets et al. 2017) claims that the Turkic people originated somewhere in northwestern Manchuria and later adopted a nomadic lifestyle and started a migration to the west. Another research, based on genetic data of ancient Turkic samples, suggest and origin and homeland somewhere in Northeastern China. 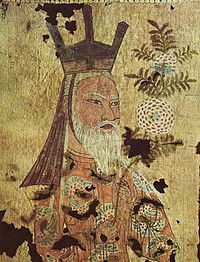 The earliest separate Turkic peoples appeared on the peripheries of the late Xiongnu confederation about 200 BCE (contemporaneous with the Chinese Han Dynasty). 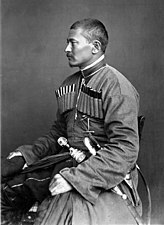 Turkic people may be related to the Xiongnu, Dingling and Tiele people. According to the Book of Wei, the Tiele people were the remnants of the Chidi (赤狄), the red Di people competing with the Jin in the Spring and Autumn period. 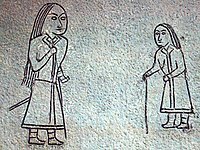 Turkic tribes such as the Khazars and Pechenegs probably lived as nomads for many years before establishing the Turkic Khaganate or Göktürk Empire in the 6th century. These were herdsmen and nobles who were searching for new pastures and wealth. 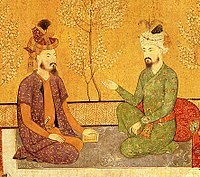 The first mention of Turks was in a Chinese text that mentioned trade between Turk tribes and the Sogdians along the Silk Road. 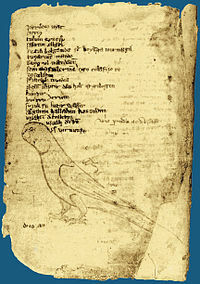 The first recorded use of "Turk" as a political name appears as a 6th-century reference to the word pronounced in Modern Chinese as Tujue. The Ashina clan migrated from Li-jien (modern Zhelai Zhai) to the Juan Juan seeking inclusion in their confederacy and protection from the prevalent dynasty. The tribe were famed metalsmiths and were granted land near a mountain quarry which looked like a helmet, from which they were said to have gotten their name 突厥 (tūjué). A century later their power had increased such that they conquered the Juan Juan and established the Gök Empire. Turkic peoples and related groups migrated west from Northeastern China, present-day Mongolia and the Turkestan-region towards Eastern Europe, the Iranian plateau and Anatolia (modern Turkey) in many waves. The date of the initial expansion remains unknown. After many battles, the western Oghuz Turks established their own state and later constructed the Ottoman Empire. The main migration of the Oghuz Turks occurred in medieval times, when they spread across most of Asia and into Europe and the Middle East. They also took part in the military encounters of the Crusades. Today most of the Turkic peoples have their homelands in Central Asia, where the Turkic peoples settled from China. According to historian John Foster, "The Turks emerge from among the Huns in the middle of [the] fifth century. They were living in Liang territory when it began to be overrun by the greater principality of Wei. Preferring to remain under the rule of their own kind, they moved westward into what is now the province of Kansu. This was the territory of kindred Huns, who were called the Rouran. The Turks were a small tribe of only five hundred families, and they became serfs to the Rouran, who used them as iron-workers. It is thought that the original meaning of "Turk" is "helmet", and that they may have taken this name because of the shape of one of the hills near which they worked. As their numbers and power grew, their chief made bold to ask for the hand of a Rouran princess in marriage. The demand was refused, and war followed. In 546, the iron-workers defeated their overlords." Since then Turkic languages have spread, through migrations and conquests, to other locations including present-day Turkey. While the term "Turk" may refer to a member of any Turkic people, the term Turkish usually refers specifically to the people and language of the modern country of Turkey. 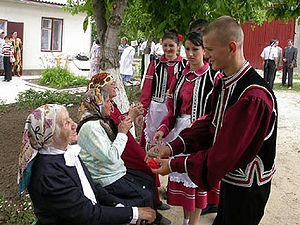 The various Turkic languages are usually considered in geographical groupings: the Oghuz (or Southwestern) languages, the Kypchak (or Northwestern) languages, the Eastern languages (like Uygur), the Northern languages (like Altay and Yakut), and one existing Oghur language: Chuvash (the other Oghur languages, like and Bulgaric, are now extinct). The high mobility and intermixing of Turkic peoples in history makes an exact classification extremely difficult. ^ a b c “Türk” in Turkish Etymological Dictionary, Sevan Nişanyan. ^ “*t`ŏ̀ŕe” in Sergei Starostin, Vladimir Dybo, Oleg Mudrak (2003), Etymological Dictionary of the Altaic Languages, Leiden: Brill Academic Publishers.